As you navigate the intricacies of APA, you may begin to wonder if your degree is worth the hoops you have to jump through and the barriers you have to crawl past in order to get it. Why should nitty-gritty forms and formats matter? Why should the word count of your abstract or placement of your headings matter so much? Why do your professors, graduate committee members, or collegiate deans keep handing things back to you and insisting that you “clean up your APA?" What is so difficult and so terrible that you may end up having to pay some smart-aleck English major $40 an hour or so to clean up for you? Whether you save the world may not depend on whether you do so in perfect APA format, but whether you save your course grade or graduate program may. Some give the reason that APA can get desperately needed funding by selling massive printings of each new edition. Others place the blame on journal editors or on professors and deans. But blame-laying aside, there really are a number of reasons for academic formats, most of which come down to a deceptively simple explanation: Professionalism. Sometimes those of us who have given our lives and sanity to the social sciences since as someone says, “But of course you’re not in the hard sciences” or, even worse, “you really ought to go into a ‘profession.’” Perhaps the composition and laws of the social sciences, including education (for nothing really is more social than education), are a little softer than the composition of metals or the laws of physics. This doesn’t make them less important or less professional. But if we want to be considered as professionals and respected as professionals, we need to behave as professionals and produce our professional materials in professional ways. Theses and dissertations no longer hide on the back shelves of university libraries—mute testimony that the writer has obtained a degree but the work probably hasn’t much connection to anyone in the “real world.” With electronic storage, access, and indexing, anyone—from college freshmen to experienced academic researchers—may find your work and look into it. You, your work, and the university that approved it will be judged as professional or not according to (1) how professional it looks, (2) how professional it sounds, (3) how professionally it has been carried out, and (4) how professionally it is expressed. You’re carrying your research out professionally—your professor(s) and/or your graduate committee will see to that. This manual is designed to help you with the other three. This chapter will look at the hoops and barriers you have to deal with as far as formats and formalities are concerned. Some are simply formalities: the specific number of words in the abstract or the spacing of footnotes, for example. We have to get around or past them because they are there. Others, such as a carefully constructed abstract and purposeful introduction, can contribute significantly to the coherence and accessibility of your writing. Don’t you love it when some “do gooder” rearranges your desk, your drawers, or—worse still—your bathroom? No matter how sensible the new arrangement may be, the sense of discomfort and disorientation is frustrating, and you may waste a lot of time looking for things that are in logical (but not familiar) places. Similarly, a professor, dean, or researcher who is trying to find important information in your paper, article, or dissertation feels comfortable and oriented when things are arranged in familiar places. There is conscious or subconscious routine/structure in reading, just as there is in daily necessities. Some of these set-up points have logical reasons, some don’t. Many of the visual formats and conventions really do make reading and processing more efficient for the reader. And you want to make things as easy for your readers as possible. Paper. For paper copies, use relatively heavy white bond: 8 1/2 by 11 inches. Use a serif font, such as Times New Roman, for the text. A serif font (like this one) draws the eye forward. Use a sans serif font, such as Helvitica or Geneva for tables and figures. Note how this sans serif font gives a clearer, cleaner line. Spacing. 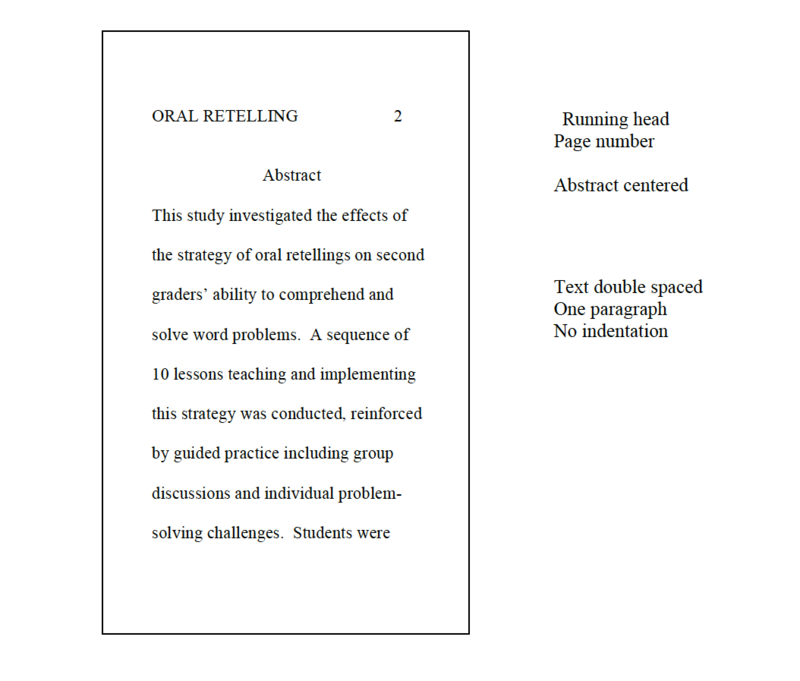 Double space the entire paper, article, thesis or dissertation. This includes the text itself, as well as titles, subtitles, quotations, footnotes, and references, unless your publisher specifies otherwise. Margins. Margins should be one inch all around. For materials that will be bound, increase the left margin an additional half inch. Alignment. Do not justify lines. The left margin will, of course, be flush, but let the right margin be ragged. The irregular spacing of the words that results from justification actually makes reading slower and more difficult. Running head. At the top of each page in the left hand corner, place an abbreviated form of the title—a running head—in all caps. Try to keep it under 50 characters (including spaces and punctuation). On the title page it is labeled as “Running head” (with just Running capitalized); on the other pages it just appears. Numbers and Headers. Number all pages consecutively from the title page. Use an arabic numeral in the top right-hand corner, at least 1/2 inch from the top of the page and 1 inch in from the side. Paragraphs and Other Indentations. Set your indentation tab at 1/2” (5 to 7 spaces), and try to discipline your autoformat to leave it there. Headings and Subheadings. Function and format of headings and subheadings will be discussed in detail in the following chapter. 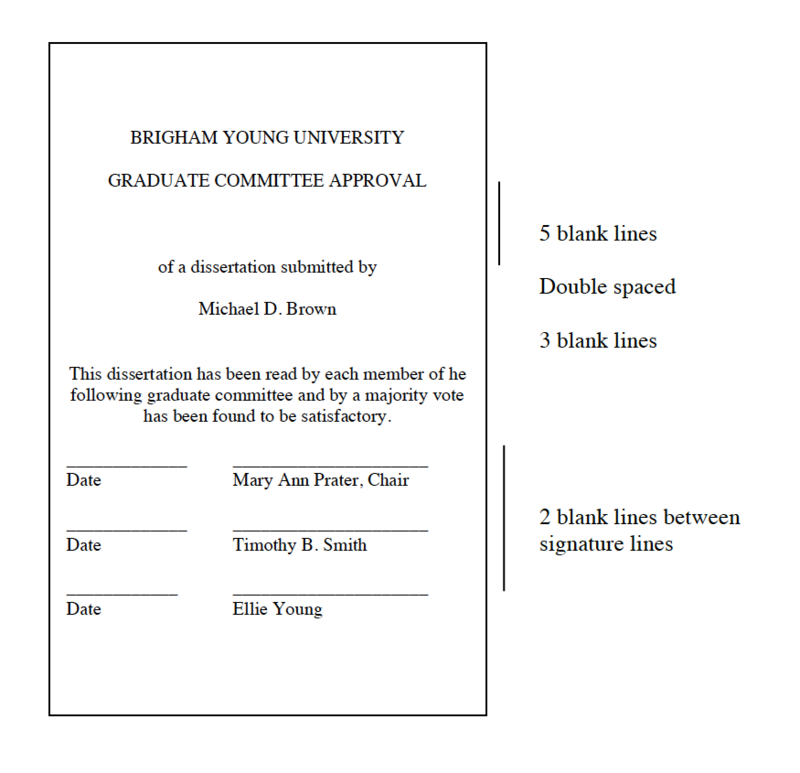 BYU has its own list of requirements and standards for theses and dissertations, particularly as preliminary pages are concerned. These can be downloaded or printed from the Graduate Studies website [http://www.byu.edu/gradstudies]. Formats and components for these pages will be briefly summarized here, and a sample title page will be included. A thesis or dissertation should be double spaced, typed with a 10-12 point serif typeface (Times Roman and Palatino are recommended). Elaborate typefaces should not be used. The document should be single sided if under 300 pages, double sided if more. Preliminary pages include the title page, an optional copyright page, approval and acceptance pages, a 350-word-or-less abstract, and an optional acknowledgements page. The preliminary pages of all theses and dissertations are to be single sided, whether the body of the text is double sided or not. The following pages have no number printed on them but are counted in the page sequence: Title page, copyright page, graduate committee approval, final reading approval and acceptance, abstract, and acknowledgements. These pages are numbered with lowercase Roman numerals: table of contents, list of tables, list of figures. The pages of the body of the text and the appendices are numbered consecutively, beginning with the Arabic numeral 1. Introductory materials such as the title page, the abstract, and the introduction are not merely formalities. They welcome the reader into your project—your research and ideas. They can have important effects on the way(s) your work is read and interpreted. 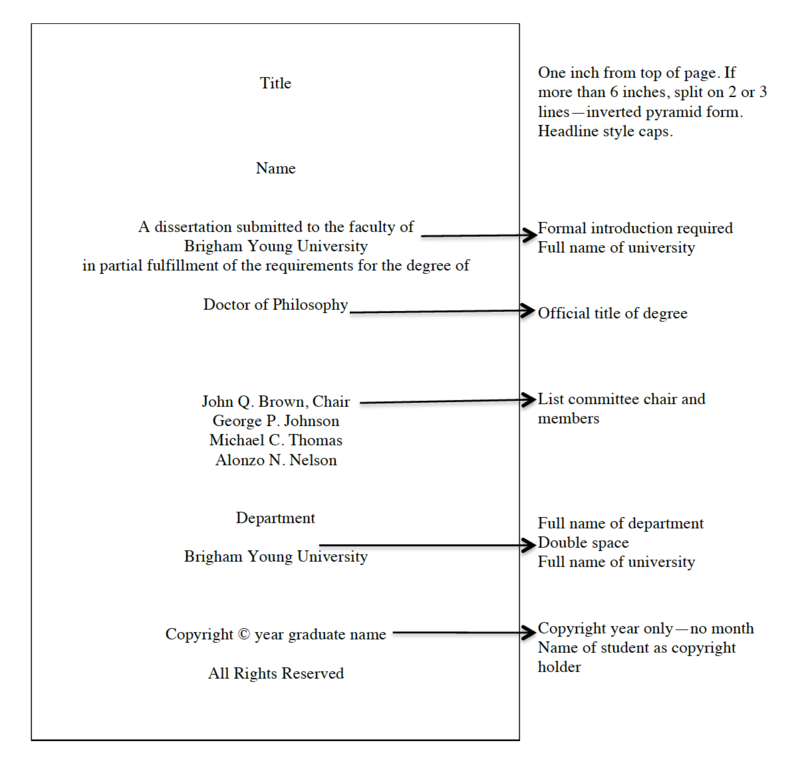 Though many of us type the title page almost as an afterthought (a few minutes before the manuscript must be in the professor’s or associate’ dean’s office, it is the welcome mat for your dissertation or article. Title. With the era of electronic databases and advanced library searches, the title carries more responsibility than it used to. Someone seeking to narrow a broad search may limit to words used in the title, and if you don’t include the right words your article or dissertation may not be found. The following steps may help you in composing your title. Go backwards for a minute. Think of the words you used in the database searches that yielded the strongest, most focused sources. List additional words that express your most important processes, relationships, and findings. Using these words, construct a title that previews fairly accurately what a reader will find in your work. Cut out extra words—a 10- to 12-word title is ideal. Byline. Type the name(s) of the author(s) one double space below the title. Give your name in its most identifiable form: first, middle initial(s), last. Resist the temptation to add “MA” or “PhD.” If you are submitting an article for publication, include your institutional affiliation as well. If no institution acknowledges you, give your city and state. Running Head. The running head makes its first appearance on the title page. It is labeled “Running head” (with just the R capitalized) followed by a colon. The running head itself is in all caps, as it appears at the top of each page of the manuscript. Author Note. Author notes are not required for most theses or dissertations, but are necessary for submitted articles. The author note identifies the affiliation of each author at the time a study was completed, indented as separate paragraphs. It may include affiliation changes, acknowledgments, or special circumstances if appropriate (see APA 6, p. 25). The final paragraph includes a contact author along with mailing address. The email address follows. Additional Information as Requested. Some journals use the title page as a place to record your contact information: work address, telephone, fax and email—sometimes even home address and telephone numbers. Some of them ask for so much information that the title page no longer appears tidy and professional—but we have to give them what they want. 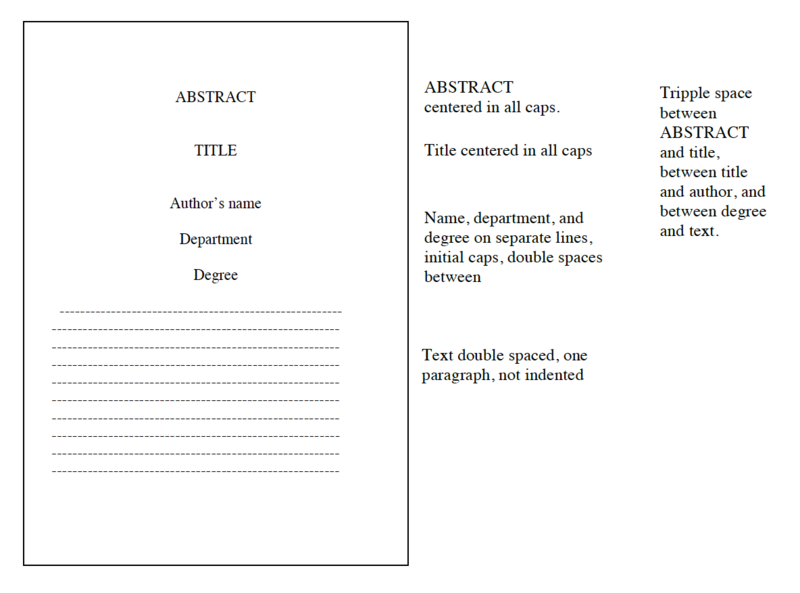 This is the basic title page required by most publications using APA format. If the title page is the welcome mat, the abstract is the front door to your presentation. The abstract will appear in databases so that readers or researchers can tell very quickly whether or not your work will be relevant and interesting to them. For most articles you have 120 words—or for a thesis or dissertation a whopping 350 words—to summarize your masterpiece. You want to work in as much solid, specific information as you can; there is no room for repetition or fluff. Since abstracts for doctoral dissertations will be published in Dissertation Abstracts International and other databases, include names of specific relevant places and full names of specific individuals, along with keywords that will be useful in electronic retrieval. Following is a fairly easy process for putting your abstract together. List out your chapter titles and your first- and second-level headings. If you have formed these carefully, they should express in simple and condensed form the main ideas and the groupings of supporting information for each chapter. As you look at this list, you can see at a glance both the outline of content and the key words you have chosen to express it. Choose the most important points. The Publication Manual of the American Psychological Association (2010) suggests no more than four or five. You may want to discipline yourself to reflect your pattern of development and the main relationships that you bring out in your work. Just summarize. Do not use the abstract as a “hook” to catch attention or as a place to validate you topic (unless it is BADLY in need of validation). Resist the temptation to use the abstract to make an evaluation of your “excellent” work. Leave statements of your strengths and limitations for later. Eliminate repetition. Repeated words and phrases are often key to noticing repeated content. Synonyms are also commonly found in verbal excess. Consolidate sentences. If two or more sentences have essentially the same subject or very similar predicates, they can often be easily collapsed into one clear statement. Use pronouns efficiently but not carelessly. It may take several words to repeat an antecedent that can be replaced by it, they, or which. Eliminate unnecessary words. Don’t waste space with “it is a fact that,” “it can be conceded that,” “it is important to notice,” “we have found it significant” etc. If these things weren’t facts and weren’t important or significant, you wouldn’t be including them in the abstract. For articles submitted to APA journals and for most course papers, the format involves the running head, the title “Abstract” and the double-spaced one-paragraph text. BYU has a specific format for theses and dissertations, which will shown in the next section. 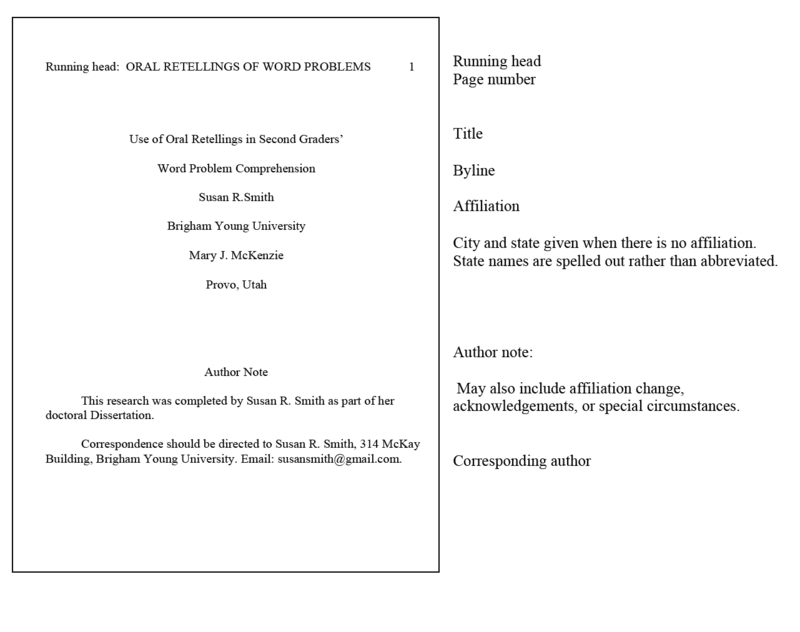 BYU has specified a particular format for the title page. A change has recently been made to eliminate the month, as month often changes between various submissions and readings. All information is centered between the margins: both top and bottom (both one inch) and left and right. If you want to acknowledge people who have contributed to your work—by way of academic and/or personal support—you may include this page to do so. If you’re a lone wolf or a rugged individualist, no one will force you to thank anyone. Just don’t expect extra favors afterwards. BYU requires a format for the abstract that gives more information than the standard APA design. The introduction welcomes your readers and makes them comfortable with your presentation by acquainting them with topic and approach and by orienting them in terms of literature and developments in the field. The introduction is not labeled unless necessary to avoid having a first page of a chapter with no heading. The following suggestions are adapted from the 6th edition of the Publication Manual of the American Psychological Association (2011, pp. 27-28). They do not comprise a sequence or process, only a checklist for inclusion (or lack thereof). Introduce your work and orient your reader. State the purpose and rationale for your research. Summarize previous arguments and evidence. Present the hypotheses and the experimental design. Discuss theoretical propositions and implications. Give necessary historical and research context. Avoid wasting your space and your reader’s time. Don’t let it get too long or heavy. Most introductions are initially way too long. Eliminate everything that is not really necessary for a reader to understand your piece. If you are uncertain about particular aspects, get your chair to advise you. Do not include an exhaustive historical review of the literature unless instructed specifically to do so. Include what you need to portray background and continuity of the research and to provide a reference base that the reader can appreciate. But do not include things that are tangential or irrelevant. Do not use the introduction as a soapbox to denounce opposing views. If these views need to be brought up early in order to orient the reader, do so efficiently and reasonably. Tables and figures can be efficient ways of presenting information: packing a large amount of data in small space, emphasizing relationships, bringing in a visual learning modality. But they should be used only when they accomplish these functions. Do not overuse figures and tables. To explore: to invite your readers to explore the data with you. To communicate: to share the data that support the meaning you have found so that the readers can understand your meaning on a deeper level. To calculate: to invite your reader to calculate a statistic or function related to the data. To store: to allow both you and your reader to have the data available for easy retrieval. To enable visualization: to attract attention and give your manuscript more visual appeal (depending, of course, on the nature of the data and the purpose and target audience for the paper). Preparing course papers may not involve tables—at least not very many of them—as many courses do not have time for heavy data gathering. However, tables are an important component for theses, dissertations, and articles. Your committee and statistics helpers will guide you in composing the tables. This manual deals only with placements and formalities. The following checklist will guide you in using tables effectively. 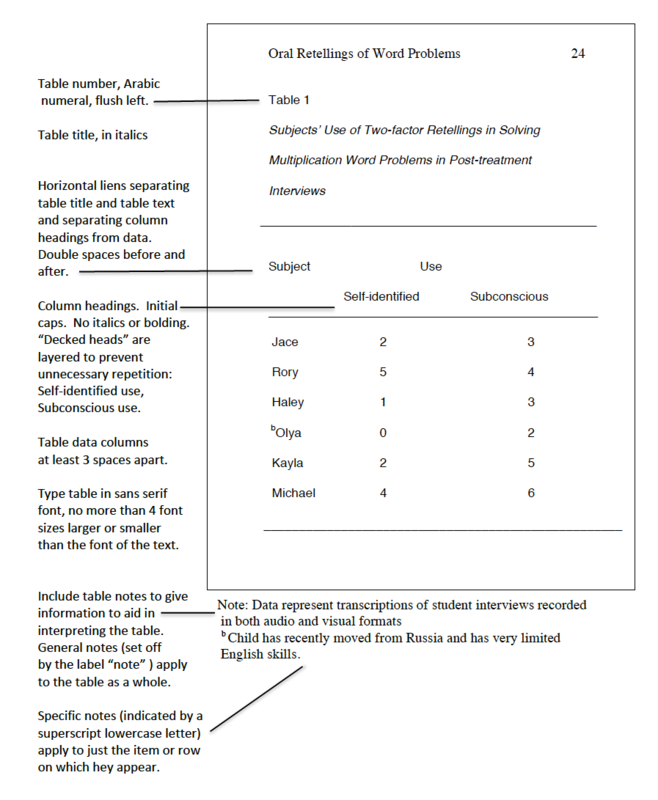 Be sure that all tables are actually identified and discussed in the text. What is obvious evidence to you may not be so easy for a reader to interpret. Number tables consecutively throughout the text. Use separate numbering for tables in the appendix (A1, A2) or for separate appendices when you have them (B1, B2, C1, C2 etc.). Avoid using unnecessary or repetitive tables. Keep tables as simple as you can: data should be easily accessible. Use horizontal lines between table title and headings and between headings and body of table. Thereafter use horizontal lines only for clarity. Do not use vertical lines in tables. Place explanatory notes immediately following a table. A general note is labeled Note; a note specific to part of a table is indicated with a superscript number. Figures attract attention and can represent complicated relationships in ways that are easy for a reader to process and remember. They are more striking and less precise than tables. As the purpose of a figure is to supplement and enhance the text, it should be discussed with enough detail that a reader can easily interpret and remember it. Be sure that figures are simple and clear, avoid crowding in too much detail. Place the figure on a full page, either immediately following or facing the page on which it is first mentioned. The page devoted to the figure is not headed or numbered. Number figures consecutively with arabic numerals outside the boundaries of the figure itself. Type the figure caption below the figure or on the following or facing page. 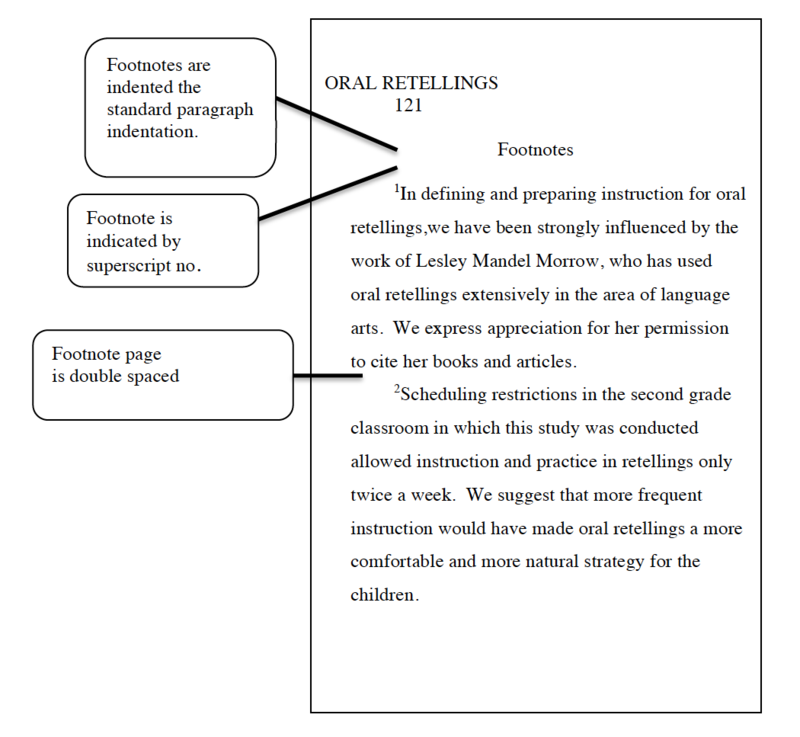 In material submitted for publication, where the figures are clustered at the end, type figure captions in a list on a separate page, not on the pages on which the figures appear. Be sure that the caption and legend explain symbols and abbreviations. The legend appears as part of the figure; thus it is within the boundaries of the figure and uses the same typeface. The caption is both a title and an explanation. It consists of a brief descriptive phrase, often followed by additional explanations of symbols or measurements. If material is to be published, captions are listed on a separate page rather than on the figures. If you have something that’s a little bulky or tangential, but someone is apt to be curious about it (and/or your chair really likes it), you can include it in an appendix. The specialist may gaze at it all he/she wants, but the casual reader who finds your dissertation on the internet doesn’t have to be bothered. Think of the appendix as a closet for your research skeletons—things that can’t be thrown away because somebody’s bound to ask about them. But you just don’t need to put them on prominent display. An appendix should contain related materials. If you have diverse appendages, you may have more than one skeletal closet. If you do have more than one, label them with capital letters: Appendix A, Appendix B, etc. Refer to them by these labels in the text (a copy of the questionnaire is provided in Appendix A). As far as form and numbering are concerned, appendices are separate closets. If you need only two levels of headings, use the formatting system you would use for a two-level paper rather than the four- or five-level system you are using for the overall dissertation. Label figures and tables in the appendix with the appendix designation as well as a number (e,g., Table B1 for the first table in Appendix B). 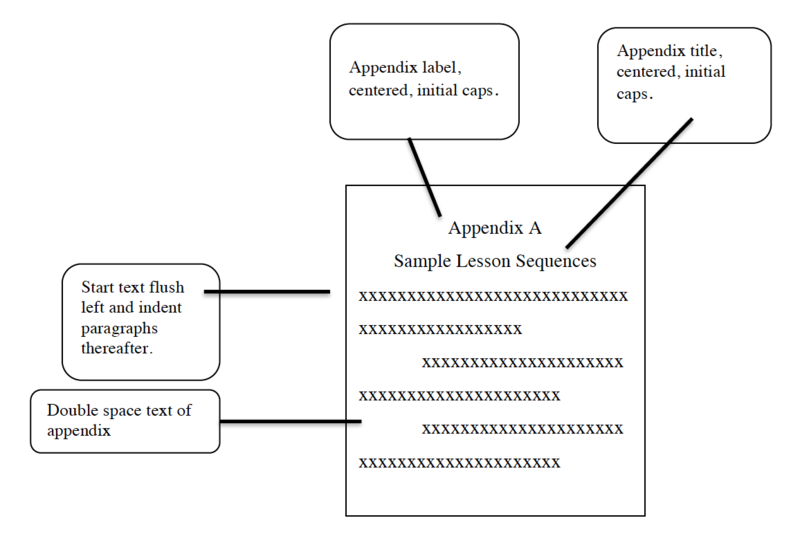 If there is only one appendix, use an A to separate it from tables in the text (e.g., Table A2 for the second table in the only appendix). Begin each appendix on a separate page. Format as shown below. 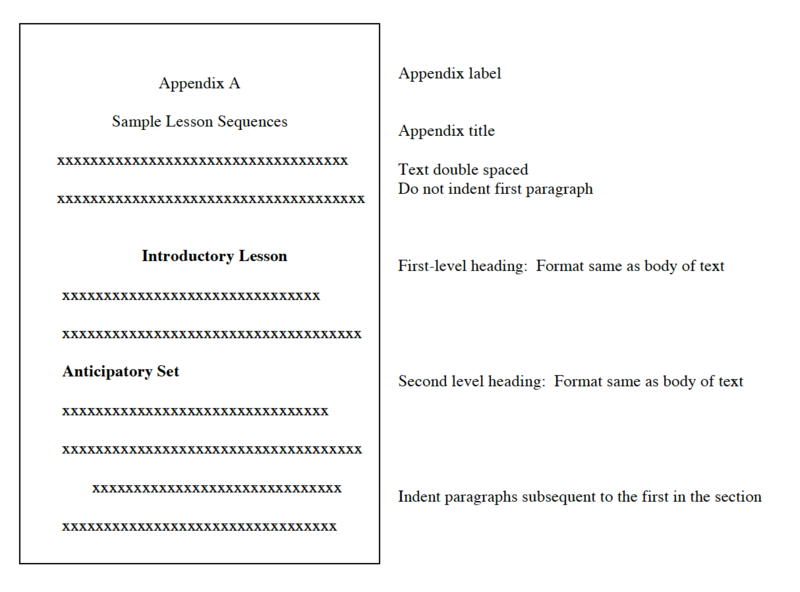 If the appendix needs headings and subheadings to make information easier to access, set them up according to the format you have used throughout the text. Notes are convenient little “asides” that help you keep from overloading your sentences and diverting your paragraphs. They allow you to be explicit without being weighty. Notes are a little like toe rings: They may not be absolutely necessary, and there are times when they do not do much good. But they can allow you some opportunities to amplify and enhance your text. APA format requires parenthetical documentation for references, not footnotes (The reference footnotes used for Chicago format are completely different). APA uses only three kinds of notes in papers, dissertations, and basic articles: author notes, content footnotes, and copyright permission footnotes. The author note gives the author(s)’ names along with affiliations. Support acknowledgements and special circumstances relevant to consideration of the piece are sometimes included. On manuscripts submitted for publication, author notes are usually placed on the title page, as shown earlier in this chapter. If the manuscript is not being published, author notes may be placed on separate sheet at the end (following references or appendix). A contact address should be given. When there are multiple authors, only one need be designated as a contact. Content footnotes allow you to make expansions and explanations that would interrupt the flow of your text and not be of interest to all readers: for example, definition of a term, identification of a key individual, explanation of an instrument or procedure beyond what is required in the text, reference to sources with more detailed explanations, or additional historical or contextual information. 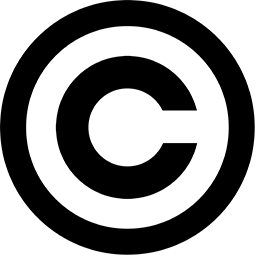 Copyright permission footnotes acknowledge the copyright holder giving you permission to use material. Both content and copyright permission footnotes are numbered throughout the text consecutively. Indicate their position in the text by a superscript number, and place the notes on a separate page following the author note. 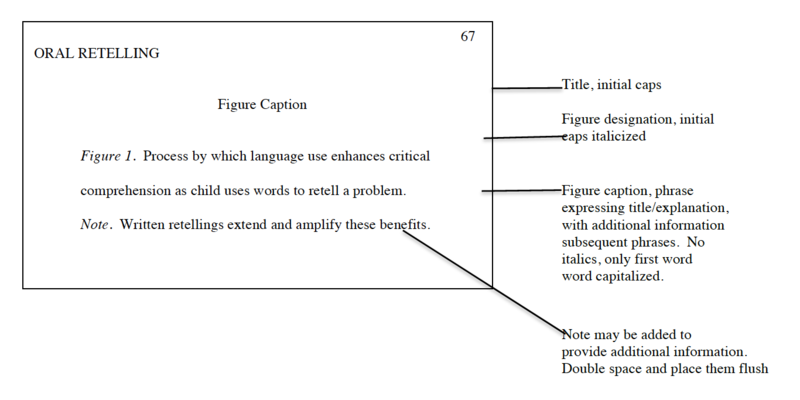 A typical page of APA footnotes would look like the following example, without the labeling, of course. Now that you have the hoops and barriers visualized so that you can discipline yourself and your computer to follow them, you’re ready for the important work: actually writing the paper, thesis, or dissertation. The next chapter gives you a few hints that may help you to make the text better organized, more coherent and easier for the reader to process. It probably seems like you have a lot of hoops to keep track of. You do. But with a little courage—and the humility to look at the manual and ask questions when necessary—you can manage them.